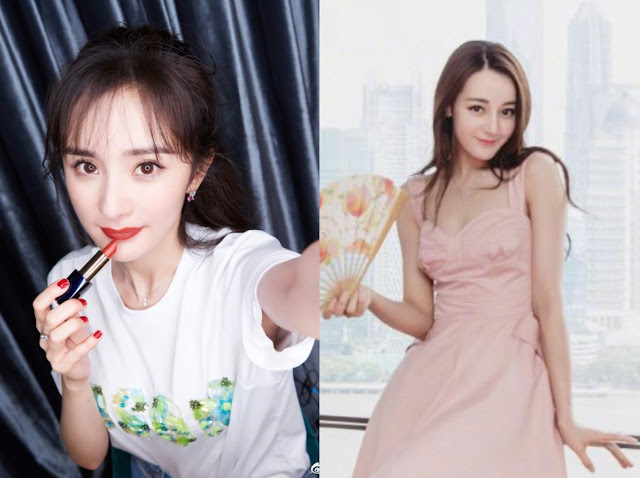 Feuding fans of Yang Mi and Dilraba Dilmurat have erupted in Weibo after rumors of Dilraba Dilmurat allegedly "stealing" Yang Mi's endorsement project. This piece of news received the ire of Yang Mi's fans and have accused Dilraba Dilmurat of being a "white-eyed wolf" (in Chinese slang it means ungrateful) since Yang Mi served as Dilraba Dilmurat's mentor and good friend. YM's fans have further accused Dilraba Dilmurat of biting the hands that fed her. The fans pointed out that without Yang Mi, Dilraba Dilmurat would not have achieved the fame that she's experiencing now especially in such a short time. Both side showed no interest to back down and YM's fan even took it to the next level. They have drawn up the achievements of Yang Mi and Dilraba Dilmurat from when they debut until age 26 (since Dilraba Dilmurat is currently 26 years old). YM's fan has considerably proven that Yang Mi has achieved more than Dilraba Dilmurat. The feud seems to only stay with the fans as reports mention that the relationship between Yang Mi and Dilraba Dilmurat are unaffected by these reports and is a good as ever. Personally, I don't think Dilraba Dilmurat stole anything. The endorsement castings rely on the company asking for the endorsement and ultimately, the final say still remains with them. If they had really wanted Yang Mi, no amount of theatrics from Dilraba Dilmurat will win them over and vice versa. I am glad that the friendship between the two ladies are strong enough to withstand rumors like this. So ridiculous. I hope both YM and Dili totally ignore all this keep rockin’ in their careers and friendship. Wait until Dilreba wanna leave. The war will be even bigger. And it’s the truth. Dilreba would not be as popular as today without Yang Mi. It was because of 3l3w and if she wasn’t a Yang Mi’s artist, she wouldn’t even be in the drama. So true. Wasn’t there a report saying Dilraba signed like a 10 to 15 year contract with Jaywalk which is Yang Mis studio? Sad to say but Yang Mi definitely made Dilraba. She’s so heavily promoted and is acting in drama after drama. I don’t believe she stole the endorsement but it’s absolutely true that without Yang Mi then Dilraba wouldn’t be as famous as she is today. I'ts not true that she stole the endorsement project. All the project it will come first be approve by the agency and the company choose which actress or actor will do the endorsement. Yang Mi is a great boss she let all the newbie to shine with her if it possible all of them will be in a drama with her. She let everyone shine and give them chance to be the main lead in a drama. They are all like precious gem to be polish. Dilraba was in other agency before she meet Yang Mi, without Yang Mi she is not as popular as now. There is a rumors before that Dilraba set up an studio I think its not good for her to leave Yang Mi's because as now she become popular but Yang Mi did a great job promoting her and giving her more project to act with. How do fans have this much time to get that far involved? If both actresses want to continue their acting career I hope they can prioritize more on refining their arts, finding better roles to star in. While they're both ok as actresses, there's still room for improvement in their acting, especially Dilraba. Personally, I prefer to watch other actresses like Jiao Jun Yan, Wan Qian, Jin Chen, Li Lan Di, Shu Chang. Their voices are also less earpiercing than these two actresses. Yang Mi is more interesting to observe as a businesswoman. Lol those actresses you speak of are indeed better in ability but they have 0 star power. People will not especially go watch a drama for them which is why their works have been flops, unless they are carried by another bigger star. LOL...Those actress you prefer don't have the ability to draw audience that's why their works have been flops unless they have been carried by the bigger star. Yang Mi wouldn't be so popular and love by many audience if her acting is bad. Yang Mi very talented actor even in business she is great. Dilraba Dilmurat gain so fast popularity in just few years through Yang Mi. Though she still lacking in acting but she is improving a lot that's why many people love her as an actress, she wouldn't be as popular as now if she didn't work hard. Being popular means you have the ability to make audience loves you. Yang Mi currently tops the chart of most popular actors in China. She is not popular if people don't love her acting. Yang Mi is not just a great businesswoman but she is an amazing actress and hardworking too. Most of her partner in the drama said that she very nice and very generous person. Never been late at work. And “She is genuine and straightforward. Dilraba Dilmurat ...she work hard for what she is now. She is love by many people that is the reason why she is popular. YM and FSF's popularity skyrocketed after Yu Zheng's Palace Gong drama. Those who go back to peek at Gong will know YM's acting in Gong was not great. Her acting has improved a lot after numerous dramas. Few actresses get as many chances as she did. She's great with business strategies, including marketing. People watch dramas for different reasons. Acting, plot, fancy wardrobe, watching their favorite stars or idols. The list of celebs with top star powers are often driven by the idol stars with huge fan bases. Huge number of fans can be attracted by star glamour. It may have very little to do with acting. Star power and acting skills do not always come together. Hardworking stars are not always great to watch in dramas and movies. Like Angelababy. It's not a necessarily good thing when a star works hard and acts for two. Overacting. But at the end, we just all have different tastes. No one is right or wrong. I'm tired of chinese fans and their fan wars. They even giving bad reviews on the other side endorsement to drag them down. And just to be clear, Yang Mi isn't Jaywalk owner but only a share holder. Her share even got smaller as the company grew bigger. They only used her name to get attention as a company and promote their artist. So if you are not happy with the contracts look for Jaywalk CEO and biggest share holders. YM is only an artist under Jaywalk who helped them to build the company and all their artist's fame. .2012: Jay Walk World Studio is established by Yang Mi in collaboration with H&R Century Pictures. .2013: The company becomes official. .March 2014: Yang Mi and her two managers, Zeng Jia and Zhao Ruoxiao, invest USD450,000 into Jay Walk World Studio. Each of the three own 19% of the company's shares. .June 2017: The company announces that it has secured USD36.8 million of new shares. Consequently, the company's market capitalisation is worth USD700 million. .2017: Jiaxing reached a deal with Walt Disney Studios to develop live action films in China. I wanted to say the same thing : I hate this fan wars. Even the actresses are fine themselves, but these fans make things into something bigger than what it supposed to. The 19% was in the beginning. Now the company grew much bigger as they have bigger investor and share holder. Yangmi only hold around 7% of the stock. The 2 biggest stock holder in Jaywalk is 2 big companies and Tencent is also a stock holder there. Yangmi isn't the owner. She doesn't have all control of the company. Her stock is enough for her to have a voice. But people said there is no Jaywalk without Yangmi because She is the start of it and they used all her resource to start and help other artist. That's why they call Jaywalk her company and calling her the boss... In a way they use her name to get more attention for the company. I've known Yang Mi through her movie You Are My Sunshine since then I become one her beloved fans. Dilraba Dilmurat... First time see her as cameo in the drama Sound of the Desert 2014 she looks so pretty dancing. Then I've seen her drama Pretty Li Hui Zhen as the main lead well I love and hate her in this drama, she is annoying lol but loving and hating an actor means they are talented and amazing that make the audience sad, happy, and annoyed. Honestly she nailed her role in the drama Pretty Li Hui Zhen. I saw her again in the drama Eternal Love with my one of my favorite actress Yang Mi since the I become one of her fans. I watch her drama Sweet Dreams I like it she has an amazing chemistry with Deng Lun and I been watching Yang Mi drama with Ethan Ruan the Legend Of Fu Yao, Yang Mi and Ethan Ruan they did a great job portray their role and they have amazing chemistry the drama stat 11 billion viewer which is really good. Fans we both love the 2 actress please stop this Fans War.. we just support them instead. Fans War isn't worth fighting for just none sense stuff. Aren't we happy that they are both doing well especially Dilraba Dilmurat her agency giving her a lot of project. She is been already pampered compared to other actress in her agency. Yang Mi very generous person she don't take all the good drama she shared. Yang Mi also promoting Bambi Zhu Xudan I hope once she will become popular as Reba don't have problem too. "Aren't we happy that they are both doing well especially Dilraba Dilmurat her agency giving her a lot of project" -> so agree with this. Think about it. If Dilraba or anyone under Yang Mi is succeeded, then Yang Mi will get the benefit too. And people will get bored if they watch the same actress over and over again, so it's better to have alternatives that make the viewers missing and waiting for them. I feel that this fan war is ridiculous. I'm a big fans of Yang Mi too, I find it funny lol every time she has a new drama I saw same people only her male main lead pair that is not from her agency from main lead to supporting actress and actress is all her people if it possible all the cast is from her agency. I'm already wondering her new upcoming drama The Great Craftsman (2019) I hope I wouldn't see her favorite people I saw in her dramas like Vengo, Reba, Lai Yi, Zhu Xu-dan, Zhang Yunlong but I would already expect she will surely put at least 5 to 6 people from her agency. I'm looking forward to see her new babies like Li Tingting, Ge Shimin, Yuan Yuxuan and Wang Yifei. I believe if they are "REAL" fans, they know YM has a good relationship with DLRB and purposely support her, fans would be supportive of DLRB as well. It seems more like some people were just paid to make the ladies fall apart in their relationship, pretending to act as some fake fans. This is ridiculous bc Dilireba is signed on to YangMi's company, which means that if YangMi didn't want her to get a CF she wouldn't get it. So obviously all the CFs that she gets are approved by her company. Some are even pushed by the company on deals where YangMi gets Dilireba a CF or gets a deal with other actors of her company to get a certain CF. This whole drama is just because for a while now their fans have not gotten along. All the recent rumors of Dilireba's fans being unhappy with her management and starting campaigns have pissed off YangMi's fans who see this as being ungrateful since Dilireba wouldn't be as popular without YangMi pushing her. It is true that YangMi has been instrumental in Dilireba's career but both fans just need to get over their pettiness. Sometimes fans can ruin relationships just by putting celebrities into situations they would have never considered without all the fandom drama. This article is quite biased. Reba fans cursed and bashed Yangmi the 2nd time and even went on hot search because Reba working non stop and they but you didn't mention anything. One it's the contract between Reba and Jaywalk. YM has no business in there. She is only a small stock holder and doesn't run the company not want to. She only want to act and only helped Reba/other artists to get their names out there yet get cursed and bashed by her fans. But what does she get in return??? Ooops! Wrong entry :P ... I meant ** thumb up** to Anon Aug 1 @ 6.02 pm.